1916, this semi-permanent bridge is 64.4 meters long and has stone piers and wooden girders and pavilions connected by a tile-roofed corridor. Viewed from a distance, this majestic bridge compares favorably with the Floral Bridge in Guilin. only inland navigational channel between central China and areas south of the Five Ridges in ancient times. The canal is dug with superb workmanship excelling nature and the scenery along the way is a concentration of natural and man-made landscapes. Sprawling in northern Guangxi, Guilin is a well-known cultural city and a scenic center with a history of more than 2,100 years. Yangshuo County under its jurisdiction is famous for its charming rural scenery. Xing'an County, 60 kilometers north of Guilin, features the Lingqu Canal, Mao'er Mountain known as the First Mountain in southern China, and the Mao'er Mountain State Park. The Zijiang River that flows in Ziyuan County 149 kilometers from Guilin is a corridor of landscapes known for their seclusion, precipitousness, wonderfulness, and gracefulness. Longsheng County, 97 kilometers from Guilin, presents the customs and habits of the Zhuang and Yao ethnic tribes, hot springs that are good for people to recuperate, and terraced fields on Dragon's Back. It flows 83 kilometers from Guilin City to Yangshuo County, an area known for its scenery in the world. The river features crystal-clear water and winds its way like a jade belt in the mountains. The Lijiang River drainage area is known .for the four excellences -- green hills, beautiful water, strange caves, and grotesque rocks -- and such scenic spots as deep pools, treacherous rapids, springs, and waterfalls. because the entire hill resembles an elephant putting out its trunk to drink from the river. The elephant has two eyes -- the elongated openings of a small cave that penetrates the hill from one side to the other. The trunk and the forelegs of the elephant form an arch known as Moon in the Water Arch. It got its name from the moon-shaped reflection it casts onto the water at bright moon night. During the high water season, excursion boats can sail through the arch. 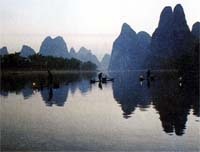 It is on the west bank of the Lijiang River in central Guilin. The 50.31-hectare scenic area has Diecai (Piled-Silk) Park, Fubo (Wave-Quelling) Park, Ronghu (Banyan) Lake, Shanhu (China-Fir) Lake, and other scenic attractions that enhance one another's beauty. The two inner city lakes are formed on the course of the city moat in central Guilin. The one in the east with China fir growing on the banks is called China-Fir Lake, and the one in the west surrounded by banyan trees is called Banyan Lake. The city of Liuzhou is in central Guangxi by northeast, on the middle reaches of the Liujiang River. It has hills at its back and overlooks the Liujiang River. There are Yufeng Hill where Sister Liu the Third, a singing immortal of the Zhuang tribe, went up to the heaven, the Dalong Pool Scenic Area which has a concentration of the Dong, Miao, and Yao-style architectural arts, and scenic spots at Dule Crag. 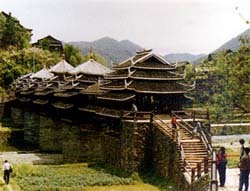 Rongshui, Jinxiu, and Sanjiang counties in the vicinities are the principal tourist areas featuring the customs and habits of the ethnic groups. Towering in Yufeng Park on the southern bank of the Liujiang River in Liuzhou, the hill has pavilions, towers, and caves tucked away among verdant trees. There are also various cliff inscriptions from different dynasties. It is four kilometers south of the city of Liuzhou. Water in the 106.7-hectare pool is so limpid and smooth that one can see the bottom. The banks are covered with a carpet of green grass, and winding paths lead to secluded places. It extends for 500 square kilometers in the Jinxiu Yao Autonomous County. The Danxiatype landform presents a spectacular landscape. There are 60 peaks, each with an elevation of more than 1,300 meters, 2,353 species of plants and flowers that are in bloom the year round. The park has a mean temperature of about 20 ? in summer, making it an ideal place to escape from the summer heat, carry out investigations, spend holidays, and admire the beauty of nature.